PCM EBook - Ultra compact, wall and desktop mountable, perfect for space constrained environments. The EBook is one of the most compact UPS on the market today. 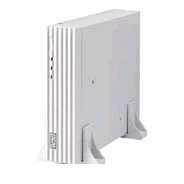 The Ebook series feature and elegant design suitable for basic UPS applications like PC and Home Entertainment systems. It's unique design enables it to be mounted horizontally and vertically and comes with a built in surge protector. E-Book 500VA, Standby MSW UPS Technology, Simulated Sinewave, Tower and Wall Mountable, Book style UPS with IEC outlets, Serial interface & Upsmon Software, Serial Communications and 2 Year Warranty. Dimensions (mm): H50 x W250 x D200, 3.7kg. E-Book 650VA, Standby MSW UPS Technology, Simulated Sinewave, Tower and Wall Mountable, Book style UPS with IEC outlets, Serial interface & Upsmon Software, Serial Communications and 2 Year Warranty. Dimensions (mm): H257 x W71 x D194, 3.9kg.